Join us for the next meeting of the CMCS-Sponsored Working Group: Media Old and New! 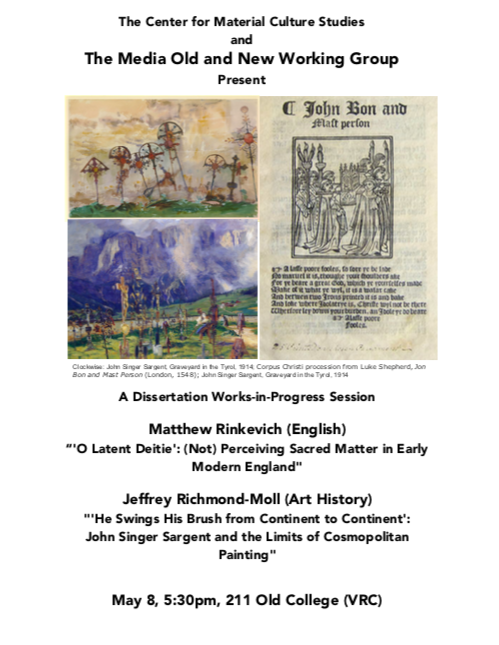 This session will include brief presentations of ongoing dissertation research by Jeff Richmond-Moll (Art History) and Matthew Rinkevich (English). Please contact Dr. Jason Hill (jehill@udel.edu) and Dr. Sarah Wasserman (swasser@udel.udu) with any questions.